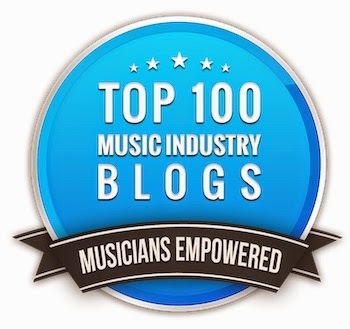 This is the last installment of my 2014 NAMM report, and it consists of a number of miscellaneous products that I found interesting, none of which I'd consider earth shattering, but worth mentioning all the same. 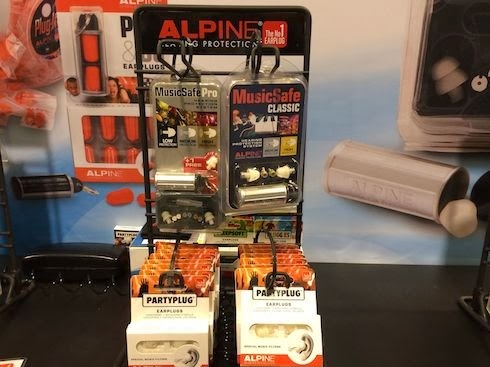 Alpine Ear Protection - There's nothing more precious than your ears, so go buy a good set of ear protectors now. I've used Etymonic Research ER20's for quite a while now and love them, but these new ones from Alpine just might be a leg up. They're a bit softer, and allow you to replace the internal filter to tailor the response. I have a pair but haven't tried them yet, but I'll report soon. They're cheaper than the already inexpensive ER20's, which is always a good thing. Big LEDs - It took professional stage lighting a while to finally adopt LEDs but now the ball is quickly rolling downhill. Only a few years ago, the size of a lighting LED topped out at 5 watts. 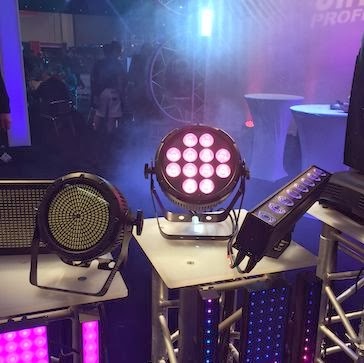 The ones in the picture by Chauvet are 15 watts, but they now have fixtures with LEDs as large as 40 watts! That means they're really, really bright. Goodbye incandescent bulbs. The Biggest Marshall Stack - Marshall Amplifiers used to be in the Korg booth, but now they're in a large booth by themselves. They still trot out the huge stack featuring all of their products though, and it's as impressive as ever. 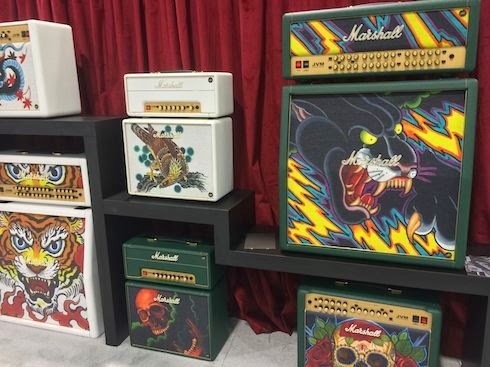 Marshall Tatoo Series - Speaking of Marshall, they now have a series of amps from their custom called the Tatoo Range, which says all you need to know. Pioneer Professional - Probably the most baffling room at the show was that of Pioneer Professional. 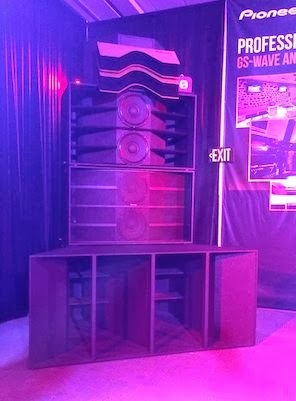 They had this huge 10 foot speaker system of horn loaded cabinets. The woofer cabs are built like the old RCA Ubangi's that we loved so much, and a detachable horn on the front like the old Community Light and Sound scoops. On the other side of the room there was a DJ setup, and that's it. No one around to explain the system, very little information, and a big question mark in general. I dug a little deeper online to find that this is called the GS-Wave series. 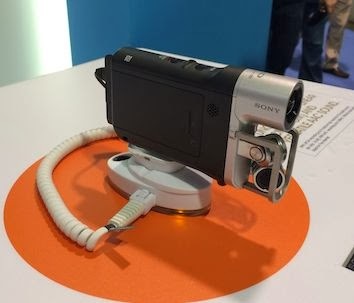 Sony Music Video Recorder - Sony came out with a video camera dedicated to music that has a lot of potential. It has a wide-angle lens and stereo X/Y mics, but it's meant to be stationary as it's not zoomable. That said, the next generation will be linkable so you can switch multiple cameras wirelessly from an iPad. That would be hot. The price is $299. 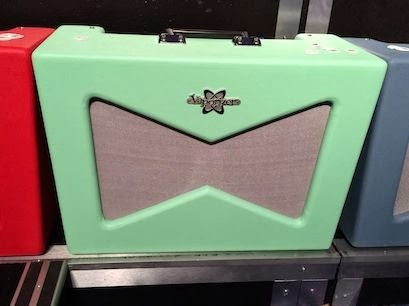 Fender Vaporizer - Fender continues its retro trend with a line of amps called the Vaporizer. This is definitely old school, with just volume, tone and reverb controls. It's 12 watts into two 10 inch speakers, and about $399 on the street. 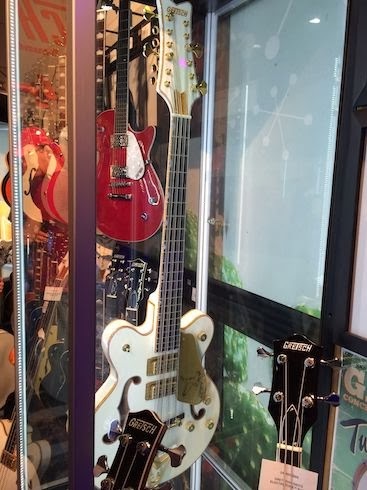 Gretsch 12 String Bass - For some reason, 12 string basses were back in a big way at NAMM this year, like this Gretsch White Falcon 12. I don't know who's playing them other than Tom Peterson from Cheap Trick, but there were a lot of them on the floor. That's it for this year. I can't wait for NAMM 2015 already.